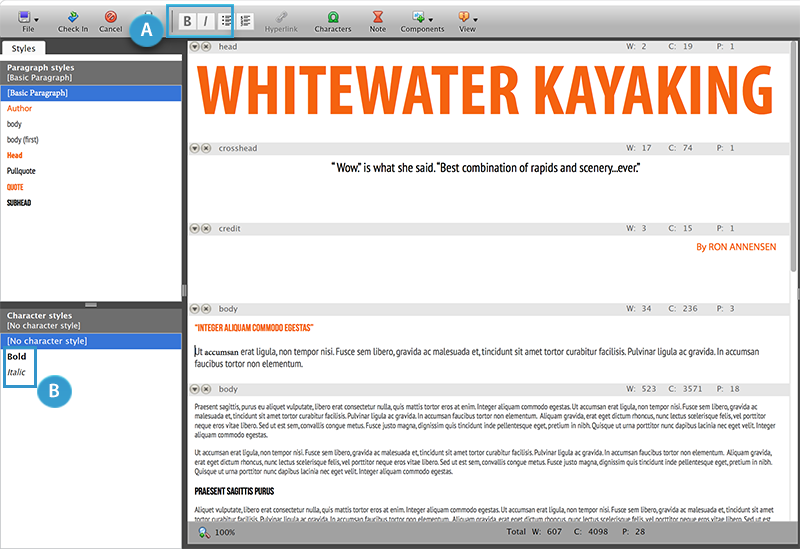 Figure: The Bold and Italic buttons in the toolbar (A) and the bold and italic character styles in the Character Style pane (B). Which method to use very much depends on your workflow and on the number of different Publication Channels in which the content is used. 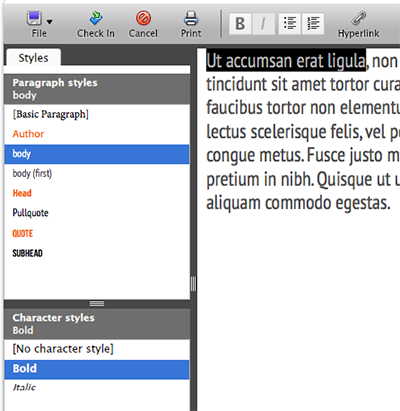 Use paragraph styles or character styles as your main method for formatting text. Use the Bold and Italic buttons or their keyboard shortucts for making (last-minute) changes to an article that is going to be published to the Web, especially when no paragraph styles or character styles are available for formatting text into bold or italic. The biggest advantage of using a paragraph style or a character style is that when a change needs to be made this only needs to be done by changing the style; all sections of text that have that style applied will then be automatically updated. When making a section of text bold or italic using the buttons or their keyboard shortcuts, you are applying what is called 'local formatting'. Although the text itself may look identical compared to applying a style, locating and subsequently changing locally formatted text can be very time consuming. Note: Using local formatting may also confuse InDesign users because they (rightly) expect that paragraph styles or character styles are used instead of local formatting. One of the disadvantages of paragraph styles and character styles is that they can only be created in InDesign or InCopy, not in Content Station. With the availability of the Bold and Italic buttons you can quickly style a section of text even when no paragraph styles or character styles are available for making text bold or italic. This happens when you have not been given sufficient Access Rights to use these buttons; they are therefore hidden. When in doubt, contact your system administrator. This happens when that style is not available in the font that is currently used. Example: When a font has a style 'bold' and 'italic' but not 'bold and italic', you can use the Bold and Italic buttons individually but not combined. When using the Bold or Italic button or its keyboard shortcut, the style is used that is first found in the font (in alphabetical order). When multiple styles exist, the selected style may not be the style that you are after. The font that I am using does not support bold or italic, but the buttons are still enabled. Why is that? This happens when the text was previously styled using a font that did support bold and/or italic. The buttons are enabled to allow you to remove the styling from the text. Once the styling is removed, the buttons are unavailable. Any text that is styled using the Bold button is rendered as an HTML tag of type '<strong>'. It depends on the CSS of the Web site how text with these tags are actually displayed. This happens when that character style was applied but later overruled by using the Bold or Italic buttons. Example: A section of text is selected and the 'Bold' character style is applied. Then, the Bold button is clicked to change the text back to regular text. In this scenario, the 'Bold' character style is highlighted in the Character Styles pane, the Bold button is de-selected and the text is shown as regular text.